Theresa A. Poulos, 86, of Cranston R. I., passed peacefully Wednesday, 4/1/2015 at RI Hospital. Born in New York City, a daughter of the late Peter and Alice (McCabe) McNally, she was the wife of the late Nicholas Poulos. They had been married for over 40 years. Mrs. Poulos had been a telephone operator for the state of RI until they changed telephone systems. She later retired from state employment in1991. 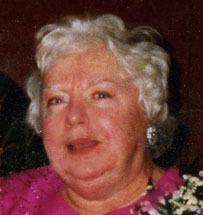 She leaves 3 sons; Peter J. Poulos of Warwick, and James N. and John T. Poulos both of Cranston, a daughter Ann F. Poulos of Cranston and 2 grandsons Nicholas and Matthew Poulos. She was sister of the late Michael, Peter, Paul, and Patrick McNally, Alice Mach, Agnes Hunt and Mary Ramsey. Her Life will be celebrated will be celebrated with calling hours Monday, 4/6/2015, from 4-7pm in the Stapleton Family Funerl Home, 684 Park Avenue, Cranston. Mass of Christian Burial Tuesday, 4/7/2015, at 9:00am in St Mary Church. Burial will be in RI Veterans Cemetery, Exeter. In lieu of flowers, donations in her memory can be mader to St. Mary Church, 1525 Cranston St. Cranston R. I. 02920.